I'm not normally into tourist traps. After all, the mere existence of these places are to provide an outlet for people to spend money with total disregard to quality and price. Honestly, how many times have you seen the "best" of anything in a tourist trap? Sure, they claim to be the best; but what exactly are they best of? There is not "best of" police around to make sure of that claim. So when I was wondering where the best clam chowder could be found, I ended up at Fisherman's Wharf. Yes, just shoot me now, I'm being a hypocrite. Honestly, despite the touristy nature of the wharf, a visit to San Francisco is not really complete without it. I'm not sa ying that the souvenir shops are a must-see; rather, the sights, sounds and smell are what you're looking for. Going into this, I was already warned that I probably won't find the best clam chowder on the Wharf. 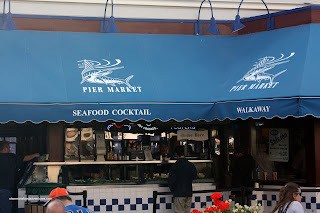 However, Cable Car Guy and AZee used to work here and they found the chowder at Pier Market acceptable and non-offensive. With not a whole lot of time to search for the best chowder, I settled for safe and predictable. What is not predictable is the availability of free parking spots nearby and we ended up parking at Safeway. You ge t 1.5 hours free parking if you purchase something. I haven't been back to the Wharf in quite some time; but those loud and smelly seals brought all the memories rushing back. 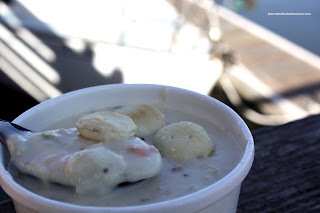 I attained my bowl of clam chowder and decided to take some scenic shots. I guess much like any place that serves seafood, a location near the sea does add to the experience. The chowder itself was a bit thin and weak. I saw the bacon and clams; but did not get any bold hits of either. 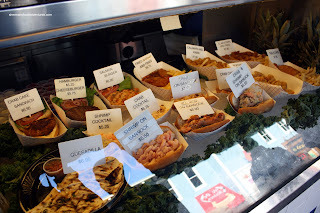 Man I fell into the trap at the Pier Market like any other tourist.. wish I had read this post earlier lol. WIsh we had a chance to meet at Foodbuzz Fest! Hi Mimimoza! Yah, Pier Market... Not good. Yah, too bad we didn't meet up. Looks like you met with TS/JS!